In the month of February 2015, second generation Raspberry Pi was made available and was commonly known as Raspberry Pi 2. Buzz was that Windows 10 will be supporting the hardware for its compatibility with the smart objects, popularly known as the ‘Internet of Things’. So, finally the Free version of Windows 10 for Raspberry Pi 2 is here. 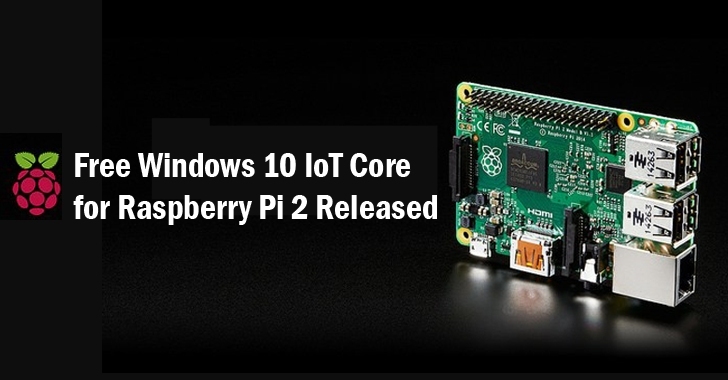 On Monday, public release of Microsoft’s Windows 10 for IoT Core, offering support for the Raspberry Pi 2 and the Minnowboard Max, was made available. Microsoft’s goal of spreading Windows 10 to a Billion user is going to get fulfilled with this specially trimmed edition for small and embedded devices, that may or may not have screens. Also for devices with screens, Windows 10 IoT Core operating system does not have a Windows shell experience; rather you can write a Universal Windows app that is the interface and ‘personality’ for your device. It’s neither the Windows, as we already are familiar with, nor a substitute for the Windows desktop, instead Windows 10 IoT Core is a single full-screen Universal Windows app. A single app at a point of time will be visible to the users accessing the system while the additional software can be run in the background. Apps are loaded onto the Raspberry Pi from a Windows 10 desktop machine. Windows 10 on the Raspberry Pi board will not run traditional Windows desktop applications, such as Microsoft Word, Internet Explorer, or Microsoft Office. As these are incompatible with the Raspberry Pi's ARM-based hardware. The universal Windows app are developed to run on different types of devices mainly PCs, phones, tablets, Xboxes and IoT-related machines like the Raspberry Pi. Universal Windows apps adapt their look and feel based on which device they are running on. Apps work intelligently, in a manner by keeping the app alive even if any feature is not compatible with a particular platform i.e. the app will work and not ultimately go unavailable, but some features may not work along. The Universal Windows apps mechanism will generate more manpower, as the apps development would require Visual Studio 2015, Microsoft's Integrated Development Environment for its platforms whose Community edition can be downloaded for free. Microsoft is primarily promoting Windows 10 IoT Core as an Operating System that makes it easier to create IoT devices with or without a display. What encouraged Microsoft to come out of cocoon was the Raspberry Pi’s low price and ability to control a range of hardware via its General Purpose Input Output (GPIO) pins with which the Windows 10 IoT core edition will go smoothly and delivering better performance. Steve Teixeira, who heads the program management team for the Internet of Things division quoted "IoT Core is designed to have a low barrier to entry and make it easy to build professional-grade devices. It's designed to work with a variety of open source languages and works well with Visual Studio." Since a beta version was released and previewed in May at Microsoft's Build developer conference, ‘Windows 10 IoT Core’ has been updated with significant new functionality, including WiFi and Bluetooth connectivity. Microsoft's IoT team and Pi-owners have been busy building since the preview, also new in the official release is improved support for Python and Node.js. Additionally, a new Express Node.js project template is available. The apps development would require an environment i.e. a PC running Windows 10, Build 10240 or later, to create and deploy apps to the Pi based systems, as well as a Raspberry Pi 2 Model B board.